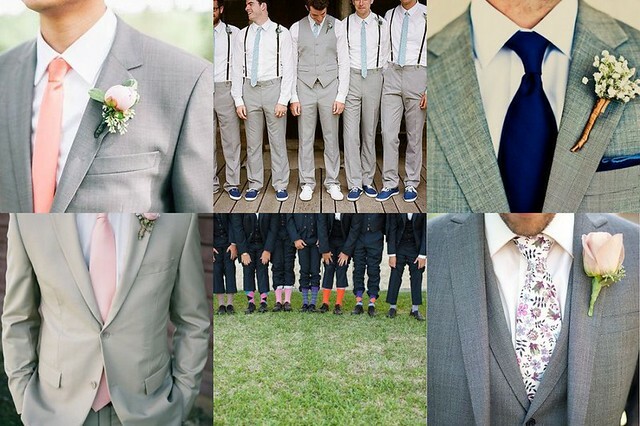 Bee's Circus: Wedding Planning: Suits. I've been super productive on the wedding front this week. Sunday we popped into a Wedding Fayre to get some information from suit vendors, and an idea of what we liked. Grey all the way, light preferably, with a waistcoat for Colin. Our reception is at his golf club, so I like the idea of the groomsmen wearing argyle socks & a cheesy photo op. The baby's breath button hole looks really cute too, and easy! I've left Colin in charge of sorting his suit now, booking an appointment and trying things on, so hopefully he actually does it. We went to a local garden centre too, and bought some flowers to try DIY-ing bouquets, which wasn't all that difficult, especially after a few YouTube tutorials. With a couple of bunches of roses, some baby's breath, greenery from my parents' garden and some ribbon, it looked pretty effective. I tried on my dress to get an idea of the length and hair styles, and bought some shoes in the New Look sale! Oh the grey is nice!! I'm loving seeing all of your wedding planning pics!! Can't wait to see it all come together!! Ten on Ten. February 2015.